Another great news for me is that Microsoft decided to merge 2 distinct MVP groups: Client App Dev and Windows Phone Dev in the new Windows Platform group. It means better interaction between both platforms which is without a doubt a great move. You can find my MVP profile on Microsoft’s website here. 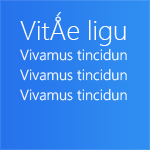 Today I’m releasing something I’m quite excited about… I call it the XAML timeline ! It’s an interactive history of 11 years of XAML development at Microsoft, from a .Net developer point of view (me!). 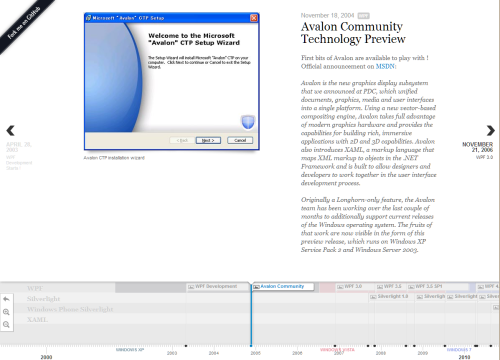 Remember Avalon ? Longhorn ? Feel free to drop a comment and share your thoughts ! In this (long) post, I share some of the techniques I used to build 2Day for Windows 8 using C# and XAML. 2Day is a powerful todo-list app with synchronization capabilities. If you haven’t given it a try yet, grab it here for Windows 8 and here for Windows Phone. No surprise here I’m using SQLite. Because I’m not big fan of SQL queries embedded deep in the C# code, I’m using sqlite-net (GitHub repo here) as the data access layer over SQLite. It’s very lightweight and provides a thin layer of abstraction. My business objects are decorated with attributes such as [PrimaryKey], [AutoIncrement], etc. sqlite-net is an open source, minimal library to allow .NET and Mono applications to store data in SQLite 3 databases. It is written in C# and is meant to be simply compiled in with your projects. It was first designed to work with MonoTouch on the iPhone, but has grown up to work on all the platforms (Mono for Android, .NET, Silverlight, WP7, WinRT, Azure, etc.). Very easy to integrate with existing projects and with MonoTouch projects. Very simple methods for executing CRUD operations and queries safely (using parameters) and for retrieving the results of those query in a strongly typed fashion. 0 dependencies aside from a compiled form of the sqlite2 library. SQLCompact has a nice “automatic change tracking” feature: when you turn this on, your objects are tracked automatically by the data access layer (using the INotifyPropertyChanging interface). When you call Save() on the database, it knows exactly what objects must be updated. Pretty handy isn’t it ? In the SQLite world, I created a small piece of code to mimicthis feature. The implementation is straightforward: I register change notification callsbacks (from INotifyPropertyChanged interface) and push updated objects in a list. When I want to save the changes, I just go over this list and send each update in the database. The collection databound to the GridView is a custom collection I was already using on the Windows Phone version. It manages groups and tasks with user defined sort options. The first versions of 2Day for Windows 8 had a bug that took me a while to fix. The exception message was “Access is denied”. I first thought it was related to I/O operation but it turns out it was related to the use of the message box ! Basically, you will get an “Access is denied” exception if you try to open a message box while one is already open. That sound silly to do that but I can assure you this kind happens once the app get bigger… and display message box in case of unhandled exception (as it was my case). A nice blog post by fellow French Microsoft evangelist Eric Vernie provides a workaround here (in French). The idea is to use a SemaphoreSlim structure that we await when we try to display a message box. If 2 (or more) message boxes are shown, they will be shown one after the other. I’m using the great Live Tile library that is available in the Windows 8 App tiles and badge sample. It makes very easy to consume a specific tile template in a type safe manner (instead of building a raw XML string). No surprise here, code sharing with the Windows Phone version is achieved through Portable Class Libraries and Linked Files. However, because of the historical choice of SQLCompact in the Windows Phone version, the data model is not shared (but implemented twice). 2Day for Windows 8 introduced a new synchronization option for the users of the app: 2Day Cloud. 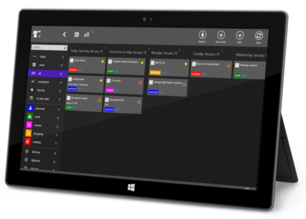 The backend powering this new sync system is Azure Mobile Services (AMS). Both the Windows 8 and the Windows Phone version uses the C# Azure Mobile Services SDK, with 100% code sharing between the two (using linked files). The Windows Phone version of 2Day uses Flurry but it will be soon updated to MarkedUp as well for coherence reason.